I went to Ye Olde Quilt Shoppe in Greensboro, NC for training on my new machine. Joanne and Kelly are a hoot! I learn some new things and got to play on their machine. Joanne was very informative about the business side of quilting and shared a lot of things that have worked for her. I really enjoyed my time at their store and am looking forward to going back over for a couple of the Wild Women classes in March. Yesterday I finished the 3rd quilt on my new system. 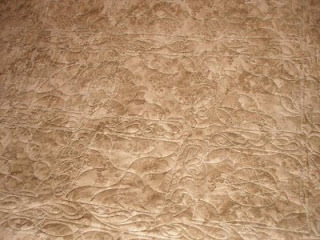 I will try to post pictures later, but I am not sure how well they will show the quilting. 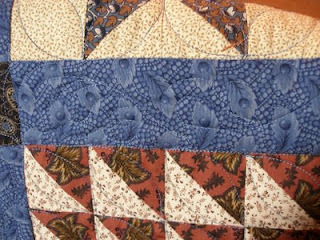 I did lots of template practice on this quilt and even tried a feather design in the sashing. With the dark backing I put on this quilt and the blue thread on blue fabric for the sashing you can not really see the design in the sashing on either side in a photo. But I was surprised at how well my first attempt at this design worked out. The blocks took me a while, but the sashing went really fast. I have 2 charity quilts to do next and will either do a panto or freehand edge to edge like whimsy. They are going to be hard to load because the backing fabric is only about 2 inches larger than the quilt so I have very little wiggle room for attaching them to the frame. I am going to sew waste fabric on the top and bottom to attach to the leaders and see if I can get the tops to float that way. Which list(s) would you like to join?